A Forest Biology Research Center has been created at UC Davis, bringing good news for students, researchers, and all of us who like to breathe clean air. UC Davis is a prime location for forest biology research and education because of its proximity to the Sierra Nevada and coastal mountain forest ecosystems and its extensive faculty expertise in all aspects of forest biology, says UC Davis Plant Ecology Professor Mark Schwartz, director of the John Muir Institute for the Environment (JMIE) where the new center is located. The new center will also provide a framework for the cross-disciplinary work so central to forest biology. The Forest Biology Research Center is working to develop a certificate program in forest biology that can be awarded along with a degree from an existing graduate program. At the Forest Biology Research Center website, you can learn more about the 24 UC Davis faculty and affiliated members of the US Forest Service who founded the center. They look forward to working with others to help develop forest biology research and education at UC Davis. In addition to Neale and Schwartz, the executive committee includes UC Davis Plant Pathology Professor Dave Rizzo, UC Davis Plant Biology Professor Alison Berry, and Research Ecologist Malcolm North with the UC Davis Department of Plant Sciences. Read the bill. That was the first policy lesson that Linda Adams, Secretary of the California Environmental Protection Agency, brought to the newly minted Ph.D.’s at the Graduate Research Symposium of UC Berkeley’s Department of Environmental Science, Policy, and Management (ESPM) earlier this month, where she delivered the keynote address. The bill Adams was referring to was AB 32, the landmark Global Warming Solutions Act of 2006, on which she was the lead negotiator. She told a harrowing tale of the legislative pipeline. Her achievements resonated with the audience; environment and climate-change related work is the one common thread among the diverse lines of scientific inquiry pursued at ESPM. Research presented by the graduating Ph.D. students included modeling the impact of climate change on a Bay Area redwood forest, studying changes bird populations in the Sierrra Nevada, analyzing the politics of chemical monitoring, and studying the growth of eco-labels and sustainability ratings—so-called “green” products and services. This broad spectrum of inquiry meshed well with the key theme of Adam’s talk: Science matters. “Every policy regulation we make here at Cal EPA is based on science,” Adams said. “We rely on our experts when developing policies and… we depend on the accuracy, the timeliness, the relevance, and the needed answers they can supply,” she said. To the delight of a room filled with fresh job-seeking Ph.D.'s, Adams said that Cal EPA employs hundreds of scientists in various areas of expertise. What do they do? As an example, Adams cited an agency-wide investigation into a spike in birth defects in the small town of Kettleman City. “It involved scientists from each department looking into potential links to water, soil, air, and/or pesticide pollution,” she said. “The Department of Pesticide Regulation provided models of pesticide activity in the formative months of pregnancy; the Air Resources Board (ARB) monitored the air in the area; the Water Board tested the tap water and canal for arsenic and other pollutants; and the Department of Toxic Substances Control tested the soil for contamination. The new world of AB 32 will generate the need for new areas of scientific expertise at Cal EPA. 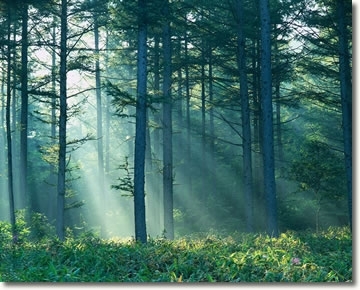 In additional to a full spectrum of chemical and environmental monitoring, there will be growing demand for forestry and reforestation knowledge. In the legislative negotiations, businesses asked for, and won, the market-based cap-and trade-program. They were not so keen on the “cap” part, according to Adams, but the “trade” part gave them the ability to purchase offsets. This means that not all their reductions have to come at their factory or refinery location; a limited portion can from areas outside their actual area of operation. That translates to forests. 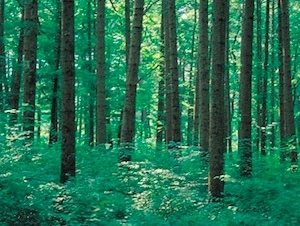 Of the four offset protocols adopted by the ARB, two were forestry protocols: one for urban forestry and one for U.S. forest reforestation and forest management projects. “We already have over 100 forestation and forest management projects submitted for approval as offsets all over the United States,” Adams said. Cal EPA is also exploring the international market for carbon reduction, through cutting-edge pilot forest redevelopment programs in Chiapas, Mexico, and Acre, Brazil. As the state begins to implement AB 32 and build a national and international accounting framework, Adams said science will be especially important. 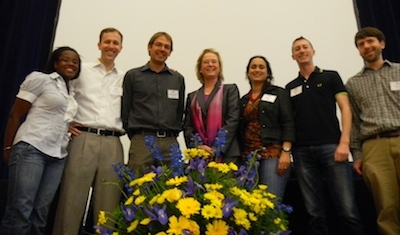 In addition to the keynote address, the May 6 Berkeley symposium, dubbed “Gradfest,” also had 15 research presentations, two poster sessions, and a career panel and to help usher ESPM graduates into the various professional arenas of academia, government, nonprofit, and the private sector. Sponsored in part by the National Oceanic and Atmospheric Administration (NOAA) and the National Science Foundation (NSF), the Community Collaborative Rain, Hail and Snow Network (CoCoRaHS) is a grassroots volunteer network of backyard weather observers. 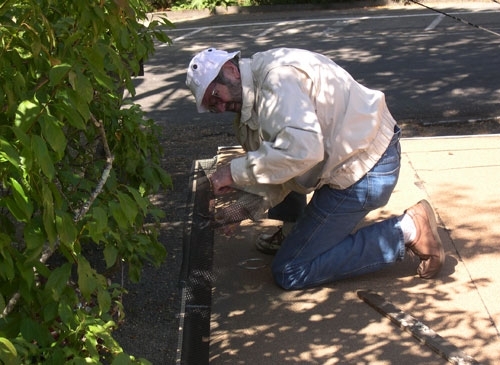 With a presence in every state in the country, volunteers from all backgrounds work together to measure and map precipitation (rain, hail and snow) in their local communities. The data is used to help scientists across the country measure and track this very important and highly variable part of the climate system. By having thousands of volunteers nationwide providing precipitation data, scientists can track each storm system as it passes across the country and see how precipitation systems vary geographically, seasonally and inter-annually. Many additional volunteers are needed to provide data for this long-term effort. CoCoRaHS provides training, education and an interactive website to which data is uploaded. It takes about five minutes a day to observe and upload data. Volunteers can participate as much or as little as they wish. Individuals, groups and schools are welcome to participate. Currently volunteers range from kindergarteners to people in their 90s. In addition to data collection, CoCoRaHS has many other opportunities for volunteers to become involved in this exciting project – locally, statewide and nationally. To learn more or to sign up, please visit the CoCoRaHS website. For additional questions, contact Nolan Doesken at the State Climatologist Colorado Climate Center, Department of Atmospheric Science, Colorado State University Fort Collins, CO 80523. He can be reached by email at nolan@atmos.colostate.edu or by phone 970.491.3690. 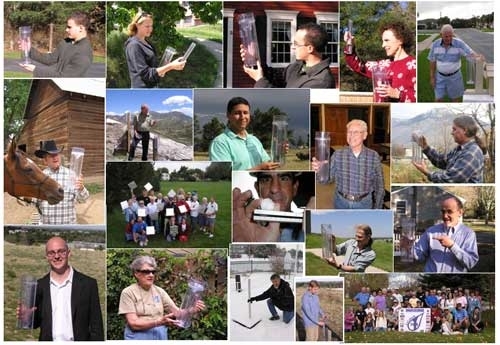 CoCoRaHS Volunteers with gauges. Photo from CoCoRaHS' website. Most people planning home improvement projects take into account how improvements will affect the home’s ability to withstand rain and weathering. We should also consider the threat of wildfire when planning home improvement projects this spring. Most homes that burn during wildfires are ignited by flying embers landing on combustible material on or near homes. A wildfire passes by a home quickly, usually in a few minutes, while the exposure to flying embers can last for an hour or more. Therefore, activities homeowners undertake to make their home less ignitable from embers do the most to ensure its survival. Home improvements should be made with wildfire risk in mind. The most important home upgrade homeowners can do to reduce wildfire risk is to replace wood shake roofs with Class A roofs. Single-paned windows should also be replaced with dual-pane windows (with at least one pane being tempered). Combustible siding can also be vulnerable, but replacing it with non-combustible siding is less important if you have done a good job of locating and maintaining vegetation near your home. Replacing combustible decks with noncombustible decking products will also reduce risk. Even though these upgrades are expensive, they reduce the likelihood that you will experience the cost and trauma of losing a home in a wildfire. If you cannot afford to undertake these projects this year, there are less expensive projects you can take on to reduce wildfire risk. These center on maintaining your home in good condition by replacing worn boards , sealing cracks in locations where embers can enter the home, and protecting vulnerable areas with non-combustible materials and coverings. Even if you have already upgraded your home to resist fire by installing a new roof, windows, or deck, it is important to maintain those home components in their proper condition so embers cannot gain entrance to the home. Creating defensible space by clearning flammable vegetation and debris is also crucial to reducing your wildfire risk. For more information on the performance of building materials in a wildfire, please see http://firecenter.berkeley.edu/ or www.extension.org/surviving_wildfire. For more on creation of defensible space, contact your local fire agency and see www.livingwithfire.info/tahoe. Plug roof openings: Install end-stops (bird-stops) at the edge of your roof if it has a gap between the roof and the sheathing (as with a clay barrel tile roof). Protect roof edges: Install metal angle flashing at the roof edge to protect the roof sheathing and fascia board, especially if there are gutters attached that can hold combustible pine needles. Even a Class A roof cannot protect the wood sheathing under it if the roof edge is unprotected. Protect roof eaves: “Box in” your open eaves with sheathing, such as a fiber cement soffit or higher grade plywood. Skylights: Particularly on steep or flat roofs, replace plastic skylights with skylights that use tempered glass in the outer pane. Maintain siding: Fill gaps in siding and trim materials with a qood quality caulk help keep out embers. Replace warped or degraded siding. Protect vents: Inspect the vents into your attic and crawl space. Make sure the screens are in good condition. Replace ¼ inch mesh screen with 1/8 inch mesh screening. Maintain decks: Replace deck boards that are less than an inch thick with two inch thick boards. Remove combustible materials from under the deck. Protect combustible siding: Install metal flashing between a deck and combustible siding to protect it from accumulated debris that can ignite during ember attack. Remove flammable material from under decks: If your deck is made from wood or wood-plastic lumber decking, remove combustibles (firewood, lumber, etc.) from under the deck. Replace gates: Replace combustible gates and sections of wooden fences within five feet of the house with noncombustible materials and components. Adjust garage doors: Your garage door can be very “leaky” to embers. Since most people store combustibles in their garage, make sure your garage door is well sealed at the edges. 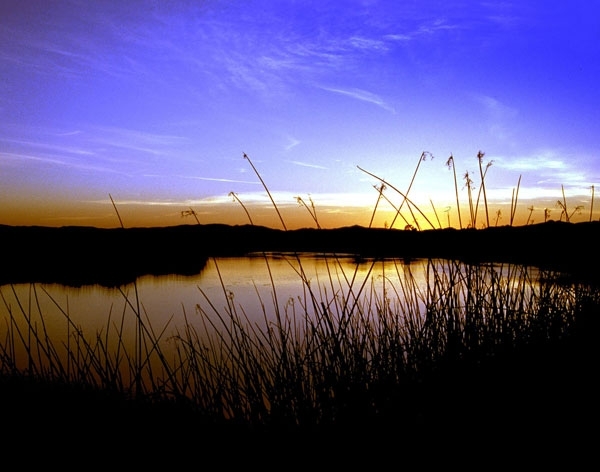 The San Joaquin/Sacramento Delta and Suisun Marsh were once part of a continuous, enormously productive aquatic ecosystem that supported dense populations of fish from Sacramento perch to salmon, huge flocks of wintering waterfowl, and concentrations of mammals from beaver to tule elk. This amazing ecosystem is gone and cannot be brought back. The once vast marshes have been turned into farmland and cities, protected by a complex system of levees. The patchy remnants of the original ecosystem are disappearing fast, as more and more native plants and animals become extinct or endangered. In their place, hundreds of alien species thrive in the altered conditions—crabs, clams, worms and fish from all over the world. We have a choice. We can let the ecosystem continue to slide towards being a mess of alien species that live in unsavory water flowing through unnatural pathways, or we can take charge and create a new ecosystem that contains the elements we want. Those elements include native species and clean water that flows in more natural patterns, creating a better environment for fish and people. The State Water Resources Control Board recently supported this concept by recommending that much more fresh water flow through the estuary to the ocean to create a sustainable estuarine ecosystem. More water is only part of the recovery picture, however, because the flows must be managed in new ways and flow through restored habitats. The historical ecosystem can be used only as a model for the new system, mainly to identify conditions that favor remnant native species and have other desirable features. But the new ecosystem will be quite different in its locations, its biota, and how it works. Internal Delta flows that create a tidally-mixed, upstream-downstream gradient in water quality, with minimal cross-Delta flows. At times much of the water in the present Delta flows towards the big export pumps in the South Delta. Fish trying to migrate upstream or downstream find this very confusing, often lethally so. Slough networks with more natural channel geometry and less diked, rip-rapped channel habitat. More tidal marsh habitat, including shallow (1-2 m) sub-tidal areas, in both fresh and brackish zones of the estuary. Large expanses of low salinity (1-4 ppt) open water habitat in the Delta. A hydrodynamic regime where salinities in the upper estuary range from near-fresh to 8-10 ppt periodically to discourage alien species and favor desirable species. Species-specific actions that reduce abundance of non-native species and increase abundance of desirable species, such as active removal of undesirable clams and vegetation. Abundant annual floodplain habitat, with additional large areas that flood in less frequent wet years. Treating the estuary as one inter-connected ecosystem, recognizing that changes in one part of the system will likely effect the other parts. These habitat actions collectively provide a realistic, if experimental, approach to improving the ability of the estuary to benefit desirable species. Some of these goals are likely to be achieved without deliberate action as the result of sea level rise, climate change, and failure of unsustainable levees in some parts of the Delta. But in the near term, habitat, flow restoration and export reduction projects can allow creation of a more variable and more productive ecosystem than now exists, while accommodating irreversible changes to the system. What a multi-purpose, eco-friendly delta could look like. Click on the image to view an interactive form of the map that lets you see descriptions of what each area might look like in a future eco-friendly delta. Update: The National Research Council has taken an interest in plans to conserve habitat for endangered and threatened species in the Sacramento-San Joaquin Delta while continuing to divert water for agricultural and urban use in Southern California. On May 5, the council declared the draft Bay Delta Conservation Plan incomplete, difficult to understand and still needing much work. Moyle, P.B., J.R. Lund, W. Bennett and W. Fleenor (2010), Habitat Variability and Complexity in the Upper San Francisco Estuary, San Francisco Estuary and Watershed Science 8(3). Cunningham, L. (2010), A State of Change: Forgotten Landscapes of California, Heyday Books, Berkeley.